W. W. Norton & Company, 9780393248913, 320pp. At exactly 4:06 p.m. on July 18, 2013, the city of Detroit filed for bankruptcy. It was the largest municipal bankruptcy in American history--the Motor City had finally hit rock bottom. But what led to that fateful day, and how did the city survive the perilous months that followed? The battle to rescue this iconic city pulled together those who believed in its future--despite their differences. Help came in the form of Republican governor Rick Snyder, a technocrat who famously called himself "one tough nerd"; emergency manager Kevyn Orr, a sharp-shooting lawyer and "yellow-dog Democrat"; and judges Steven Rhodes and Gerald Rosen, the key architects of the grand bargain that would give the city a second chance at life. Detroit had a long way to go. Facing a legacy of broken promises, the city had to seek unprecedented sacrifices from retirees and union leaders, who fought for their pensions and benefits. It had to confront the consequences of years of municipal corruption while warding off Wall Street bond insurers who demanded their money back. And it had to consider liquidating the Detroit Institute of Arts, whose world-class collection became an object of desire for the city's numerous creditors. In a tight, suspenseful narrative, Detroit Resurrected reveals the tricky path to rescuing the city from $18 billion in debt and giving new hope to its citizens. 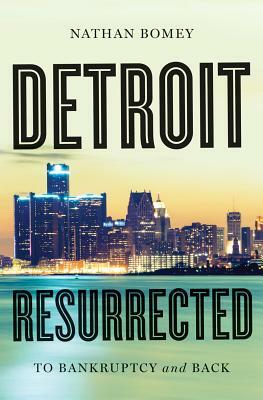 Based on hundreds of exclusive interviews, insider sources, and thousands of records, Detroit Resurrected gives a sweeping account of financial ruin, backroom intrigue, and political rebirth in the struggle to reinvent one of America's iconic cities.